The handling, storage conditions, and mushroom preservation method used after harvest ensure preservation of mushroom quality in the finished mushroom product. Shiitake, Maitake, and Oyster mushrooms are exceptional mushrooms to eat when they are prepared fresh and simple refrigeration can keep the mushrooms in good condition for up to two weeks in the case of Shiitake mushrooms or up to a week in the case of more perishable mushrooms like Oyster mushrooms. This type of shelf-life is assuming high-quality undamaged mushrooms that is packaged appropriately and rapidly cooled after harvest. In the event a person has a surplus of fresh mushrooms which they need to preserve, the mushrooms can either dried or used to make something for later use that can be canned or frozen such as an Oyster mushroom pasta sauce. Reishi mushrooms, which are too tough to be enjoyed fresh should be dried shortly after they are harvested. Teas and extracts can also be made from Reishi mushrooms immediately after the Reishi is harvested, however traditionally Reishi teas and extracts have been made starting with dried Reishi mushrooms because it is often more practical to dry a large quantity of mushrooms while they are being harvested and then use them to make something after the harvest period is finished. Cordyceps sinensis is another mushroom that was used in Traditional Chinese Medicine after it was dried. It is important to note that many mushrooms may mold if they are not dried shortly after harvest and also kept dry during storage. Solar dehydrating can be accomplished simply by setting a couple mushrooms on the dashboard of a car with something under them to prevent possibly damaging the dashboard, especially if it is a mushroom you have not attempted to dry before because some types of mushrooms do not dry well, with an extreme example being those in the Coprinus genus which tend to turn into a pool of black goop instead of drying. Mushrooms can also be dried like herbs simply by hanging them on a sting that is positioned in the sun or dry area with ventilation. 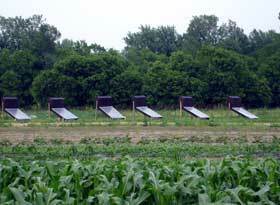 A small black box with holes for ventilation can also be a simple method of using the suns energy to dry mushrooms. It is important to note while it is essential to keep the mushrooms below 140 degrees F to preserve nutritional and potential medicinal values, but it is also important to have the mushrooms reach a temperature that can effectively kill any eggs that insects may have deposited in the mushrooms. 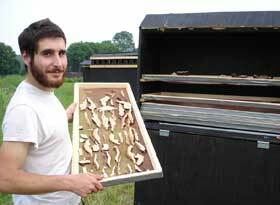 Freezing the mushrooms after they are dry is another common method for preventing long-term storage problems due to insect damage. 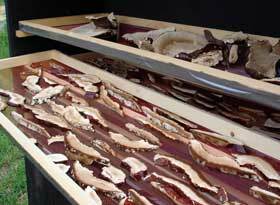 We dry the Reishi mushrooms we harvest in the passive solar dehydrators you see here. 1) Avoid additional fossil fuel inputs; most commercial mushroom operations that dry mushrooms rely purely on fossil fuels for the heat and air-flow needed to dry their mushrooms. 2) Protect the drying mushrooms from insect damage. 3) Allow regulation of the air flow and temperature of the dehydrator so the mushrooms are are dried as quickly as possible without going above 140 degrees F.
We store our dried Reishi mushrooms in airtight containers with silica gel packets to ensure they stay absolutely dry to avoid the risk of mold which could happen if they got damp after they were dried.